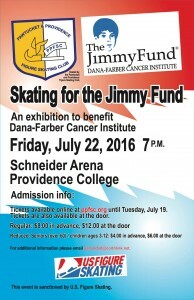 On Friday July 22 at 7:00 p.m. at Providence College, the Pawtucket and Providence Skating Club will be hosting an exhibition show to benefit The Jimmy Fund’s Dana-Farber Cancer Institute. The show will be hosted by 1992 Olympic bronze medalist and 1994 Olympic silver medalist Nancy Kerrigan, who is also a native New Englander. The cast features U.S. bronze medalists Marissa Castelli, a native of Rhode Island, and her partner, Mervin Tran; 2011 U.S. silver medalist Richard Dornbush; 2015 Skate Canada Autumn Classic silver medalist Sean Rabbitt and 2016 U.S. pewter medalists Anastasia Cannuscio and Colin McManus. Figure Skaters Online caught up with show organizers Wendy Sheridan and Gloria Haddad about the show. Figure Skaters Online: The Pawtucket and Providence Figure Skating Club is one of the premier skating clubs in New England. Tell us a little more about the club, especially for those not familiar. Gloria Haddad: The Pawtucket and Providence Figure Skating Club currently has about 90 members. It was founded in 1938, making it one of the oldest clubs in the country. Just a few years ago, we celebrated our 75th anniversary, a milestone that was recognized by U.S. Figure Skating at its annual Governing Council. We have skated at numerous rinks in the area over the years(some which are no longer in existence). For about 25 years, Dennis M. Lynch Arena in Pawtucket was our main facility until last year when the rink was sold. The new owner purchased the rink to house a hockey program and most of the renters (including our skating club) had to find ice at other facilities. We were fortunate that we had ice booked on Sundays at Providence College, which is what carried us through this past season. This fall we are slated to move to a new facility currently under construction in Attleboro, Massachusetts. FSO: Some notable skating stars have represented the Pawtucket & Providence Figure Skating Club, right? Gloria: Yes, among the notable members in our history are Edi Scholdan, Dudley Richards,and LeeAnn Miele. Edi was a competitive skater and highly successful coach. Dudley competed at the World and Olympic level. Both were a part of the U.S. delegation to the 1961 World Championships that was killed when their plane crashed on route to Prague, Czechoslovakia. The entire U.S. World Team died in that crash. Each year, our club gives awards to individual skaters named in honor of these men. LeeAnn Miele was a pioneer in synchronized skating and served as an international and world judge in “synchro.” In addition, she was a national judge and referee with U.S. Figure Skating in all disciplines. 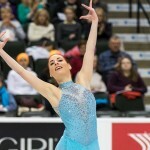 Our annual synchro competition, originally called the Providence Synchro Open, was renamed the LeeAnn Miele Synchronized Skating Open to honor her contributions to the sport. FSO: For those not familiar with the Jimmy Fund and Dana-Farber Cancer Institute, can you explain what these organizations do? Gloria: Founded in 1947, Dana-Farber provides adults and children with cancer with the best treatment available today, while developing tomorrow’s cures through cutting-edge research. It is internationally known for its research and patient care. The Jimmy Fund exclusively supports Dana-Farber Cancer Institute, raising funds for adult and pediatric cancer care. Since its founding in 1948, the Jimmy Fund has raised millions of dollars through thousands of community fundraising events such as the one we are hosting. FSO: Why did you select the Jimmy Fund and Dana Farber Cancer Institute? Is there a special connection to the organization? Gloria: Several of our club members have either had cancer themselves or have had family members who have struggled with this illness. One member approached me with the idea to host a benefit for a cancer-related charity. One thing led to another, as they say, and before long we had a date booked and the Jimmy Fund selected as the charity. This is our first benefit show. Wendy: The Jimmy Fund is well-known throughout New England and beyond and most people from our region instantly recognized the name and the wonderful work they do. Like Gloria said, the idea to host a special show came from a long-time skating member. Her immediate family had been deeply affected by cancer and she approached the club officers earlier this year and urged them to consider having a special exhibition to raise funds for a cancer charity. FSO: You have quite a few well-known guest stars participating in your show. How did you go about reaching out to them and asking them to be apart of the show? How has their involvement been with promoting the show? Wendy: Some of the criteria I always mull over/ponder when thinking about special guest skaters are ‘who is a natural performer, who connects well with audience members, who brings the audience into their programs?’ You know, skaters who have that ‘Wow’ factor, a lively personality and the ability to bring an audience to their feet are some of the things I consider. I believe we have that: a diverse and exciting mix of skaters. We have a nice balance of soloists, ice dancers and Theatre on Ice representing our New England clubs. I am also really grateful to the Team USA members (Richard Dornbush, Anastasia Cannuscio and Colin McManus, Sean Rabbitt and Marissa Castelli and Mervin Tran) and the international soloists representing ISU member federation countries (Aimee Buchanan, Brooklee Han, Natalie Sangkagalo) who are taking time away from their pre-season training to join us. The local and New England skaters have been actively helping to promote the show. We offered everyone in the cast a challenge (eh, an opportunity!) to “Make a 30-second Video for Social Media”. I received more than a dozen videos from cast members and about half them are now up on Twitter and Facebook (Editor Note: see some of videos below). We’re hoping that this will help spread the word about the show to more skating fans, cast members’ friends, colleagues and family. All the promos submitted are original, creative and each have a signature theme about the Jimmy Fund and the Dana-Farber Cancer Institute. We connected with Nancy through a mutual skating colleague of ours (competitor and coach, Brad Vigorito) who is a former student of Paul Wylie’s. Paul (who is long-time friends with Nancy) graciously forwarded our letter of invitation to her. We were so thrilled when she accepted the invitation. FSO: Marissa Castelli is from Rhode Island (she now trains in Montreal). The show will be a homecoming of sorts for her. Is her family/friends planning on being there? Is she excited to be apart of this show? Wendy: We are very excited that Marissa is performing in the show. There has been a lot of support for her from the local skating community over the past eight years. She is Rhode Island’s only figure skater to reach Olympic competition in the past four decades, so we are thrilled that she and her partner, Mervin Tran are traveling to Rhode Island for this special event. Her entire family will be in attendance on July 22, so truly it is a homecoming for her and the Rhode Island skating community. FSO: Nancy Kerrigan is also a native New Englander. In addition to helping to draw more skating fans to come see the show, how is having big-time skaters from the New England area promote skating in general for the upcoming skaters? Wendy: We are incredibly honored to have 2-time Olympic medalist and skating legend Nancy Kerrigan host and perform. Nancy has been an inspiration to thousands of young, up and coming competitive skaters over the past two decades and her presence and participation will certainly encourage our young club members and show soloists to strive farther in reaching their competitive skating goals. FSO: How has the preparation gone for the show? When did you start planning this show? Gloria: We started actively preparing for the show in March. In hindsight, we should have started earlier. That would have given us more time and would have made the last few weeks less intense. FSO: How have ticket sales gone? For those who are thinking about coming, why should they come see this show? What do you hope they take away from this show? Wendy: Tickets went on sale in mid-June and the numbers are beginning to pick up steadily. Three local media outlets (NBC-10, WPRI-TV and WPRO radio) will be interviewing some of the special guest skaters. (Gloria and I will be interviewed for one of the newscasts). We hope this will help encourage more members of the Rhode Island community to attend the show. New England is a major region for sporting events and there really is a strong fan base for figure skating. For example, Boston has hosted three premier figure skating events in the last three years: the 2013 ISU World Synchronized Skating Championships, the 2014 Prudential U.S. Championships and most recently in March, the ISU World Championships. All had record audience turnout. In past years, Rhode Island has also been one of the featured stops for both the Stars on Ice tour and the former Tom Collins Champions on Ice tour. Being that this is a show to benefit a major charity, we are hoping that the public will embrace the event and come out and support this fundraiser. FSO: What are the plans for Pawtucket and Providence Figure Skating Club in the future? Gloria: In September, we will be hosting the Providence Open, a competition that Pawtucket and Providence Figure Skating Club has hosted for over 40 years. In early December, we will have our annual Holiday exhibition, which is open to all club members. The last of our big events for the season will be the synchro open, which will be held in mid-January. Once that is over, I think we are going to need a good rest. To learn more about the show and to purchase tickets, click here.